When learning about science, geography and history children need to be swept away - to be transported. Such is the power of the impressionistic lessons embedded in the cultural curriculum of a Montessori classroom. These great stories excite and surprise, and open-up new ways of thinking about the universe and time. Who has not once picked up a stone that spoke to us in some mysterious way and slipped it into our pocket, or carried it with us - admiring its color or feeling its unique texture and weight as we walked along? Stones such as these tell the stories of our travels; indeed, they seem to conjure the very memories of where they were found, years distant from their discovery. 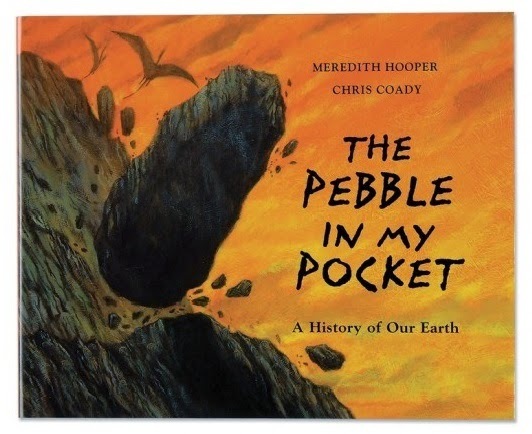 In The Pebble in My Pocket: A History of Our Earth, written by Meredith Hooper and illustrated by Chris Coady, a common pebble is the ticket to ride. Children relate to the story by first remembering the rounded stones in their gardens, those along the sidewalks on the way to school, and ones found in the gullies near to where they play. The book opens by taking that relationship a step further, asking “Where did you come from, pebble? Hooper’s animated prose moves the reader through the Earth’s geologic history, telling the story of one pebble’s journey in language that is child-friendly, descriptive and energized. Coady’s vibrant drawings of how weathering and erosion have transformed, and continued to transform, the planet’s surface enrich the story and make the content very approachable. Playfully, both author and illustrator allow the reader to experience geologic time by highlighting the major transformations of local landscapes, climate changes, and the pebble’s interaction with intriguing extinct creatures. Each pair of pages draws us nearer to more fully understanding the humble pebble sitting on our own bureaus or desks or bedside tables. The Pebble in My Pocket offers a novel perspective on a common item, found easily and often looked over or taken for granted. Certainly, much of the book’s power rests in just that: spotlighting the beauty in the seemingly mundane and telling that tale. Beyond cultivating a deeper appreciation of science, however, could the story told here also be a metaphor for the quest for greater interpersonal acceptance? How often have we each felt simple and ordinary? How often have we wished for greater understanding beyond what others might see or perceive on the surface?